First picture on race day! We arrived at the DAK parking lot and were greeted by friendly cast members yawning and directing us to "walk toward the light". Off in the distance, we saw bright lights and lines beginning to form. Even though it was very dark and very early, the DJ was spinning, the sound system was loud, and the crowd was getting pumped. Bag checkers, ready for action! We made our way through the mostly-empty lot, past bag check and toward the bright lights & lines. We got in the main line, which had already grown quite a bit- there were probably about 200 people or so ahead of us. I knew what we were in line for; I discovered later that my running partner thought perhaps we were in line to register, or to pick up some last minute race info. I'm glad I didn't ruin the surprise when we first got in line! We took in the atmosphere, talked to other runners, and felt the excitement build! Suddenly, it started...snowing! A huge snow machine was generating lots of the powdery white stuff, adding to the Jingle Jungle theme. (In case you're wondering, it's pretty impossible to capture snow in an iPhone photo. I took lots of shots, but you can't really see the snow in any of them!). After waiting in line for about 15 minutes, I was shocked to turn around and see what seemed like thousands of people lined up behind us. I'm glad we were on that first bus! Before we knew it, we were at the front of the line- and it was worth the wait! It was now almost 6:15, so it was time for port-a-potties. OK, I know that everyone hates port-a-potties. I hate them too. I really hate them. It's not for the typical reasons, though. I'm not at all squeamish, and I'm about as far from a germaphobe as you will find. I am very well acquainted with port-a-potties. In my younger days, I was an avid concert-goer. I spent many years touring around from concert to concert, festival to festival. Using port-a-potties with the masses for days, sometimes weeks, on end- this was routine for me. In my extensive experience with port-a-potties...I have seen things that would frighten the strongest of hearts, minds, and stomachs. I've been through the port-a-potty trenches, and thankfully, I've emerged relatively unscathed. I'd like to leave the port-a-potty part of my past behind me. I've "done my time", so to speak, with these necessary vessels, and I'd be content to never have to use one again. But alas, I can't risk having to pee midway through the race! Relatively speaking, these were great. There were no lines! In and out- these runners are an efficient bunch. Port-a-potty stop done, time to head to the corrals! We were in corral C. When I registered for the race, I had to give an estimate of my mile time. I estimated high, which put us back here. The excitement continued to build as we headed to our corral, chatted with other runners, checked out some fun costumes, and watched daylight break over Animal Kingdom. Before I knew it, time was ticking down close to the start. It was time! Corral A was ready to go. Fireworks! Excitement! Corral B went a few minutes later, then it was our turn to move up to the gate! I hit my stopwatch as I crossed the starting line, and we were off! It was very congested just out of the gate, but after a minute or two, people started spreading out. My sister and I stayed together for about 7 minutes. After that, she pulled ahead as I did my first walk interval. In training, I followed a pretty regimented plan, running and walking for exact intervals, eyes constantly on my watch. I didn't want to miss everything going on around me, so I decided to wing it with my intervals during the race. I just ran until I felt like I should do a walk interval. I loved being able to look around the whole time, instead of constantly looking at my time. Running through the parking lot was a little boring at first, but we rounded the corner and I could see the entrance to DAK up ahead! Crossing the little bridge to get to the entry plaza was my first taste of what would be a big problem throughout the race. Walkers- three, four, even five across- completely blocking the way. Runners had to come to dead stops behind them on this narrow bridge. I thought perhaps these people were a fluke- surely walkers know to keep to the side, and not walk several abreast? This would turn out to be a problem at many places along the course. I get the walking part- I do walk intervals. But I keep to the right, I look around so I'm not stopping short in front of anyone, and I ease myself back in when my walk interval is over. There were so many people who seemed oblivious to these simple courtesies. Even more puzzling to me was why none of the race volunteers- of which there were many- ever gave a reminder of any sort. A simple "walkers please stay to the right" every now and then would have helped tremendously. Why don't they provide these reminders, when they know they have lots and lots of walkers in the race? It seemed like it would have helped a lot, because I think many people just didn't realize what they were doing. 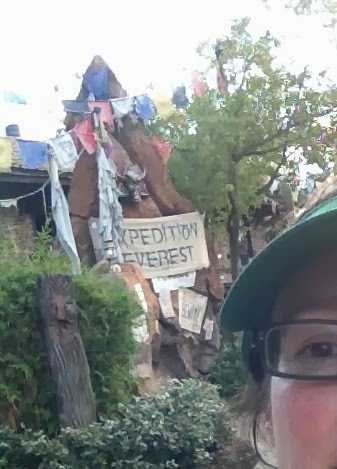 After the bridge, I passed the walkers and had the DAK entrance in my sites! 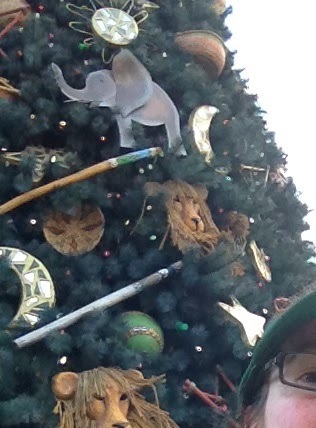 I was running strong, and had to decide if I wanted to stop for my first photo opp- the Animal Kingdom Christmas Tree, just outside the entrance! I had never seen it in person before. Rather than wait in a line for a real photographer, I attempted a selfie. I'm really bad at selfies. Approaching the entrance gave me an incredible thrill! I was actually going to be running through one of the parks! I crossed through the turnstile area and was greeted by several cast members cheering us on. I had a HUGE smile on my face as I entered the oasis and started running up into the park. A CM called out, "Go, Peter Pan! ", and it gave me the extra boost I needed to tackle this little uphill section. At the top of the hill, about to cross over to Discovery Island and really get into the park- what was this?? People coming back already?? I couldn't believe how quickly the people in corrals A & B made it through the park- they were already exiting! I knew I better savor every moment here! There were lots of character stops for photo opps, but I wasn't really interested. I'm not a huge fan of most of the characters, and I really didn't want to waste time in lines. I did stop for a few pics, but none with characters. I was really tempted to step off the route and check out the construction going on in Africa for the new Festival of the Lion King amphitheater, but I decided to keep going. The mighty Everest lay ahead! The in-park time seemed to go so quickly! I would have loved to keep running inside Animal Kingdom, but the course was leading us out "backstage"- which was not as scenic, but definitely interesting! I always love seeing the behind-the-scenes stuff, so this area was fascinating to me. Backstage- a cast member's cafe! ...and if you don't like any spoiling of the magic, look away now! The majestic and foreboding Mt. Everest...from the back. I believe this was about the 2.5 mile mark. I felt great! There's something about running with a group that always pushes me farther and gives me the extra power I need. I don't do it often enough! It was getting a little hot at this point, but I was feeling strong and running well. Before I knew it, we were out of the park and I knew I was almost done. Just as I was approaching the finish line, I saw Erin, a Disney running enthusiast I've followed for quite some time on various social media outlets. She was cheering people on from the sidelines, and even though she doesn't know me, I had to call out to her to say hello. It felt good to see a familiar, supportive face as I was getting close to the end. So much encouragement and support from this community! Then, it was over in a flash. I crossed the finish line, was handed a medal (which surprised me- I thought it would be put on my neck! ), was shuffled through a photo area, and picked up my box of post-race treats. 46 minutes- not bad for getting stuck in a few spots, and stopping to attempt a few photos! I met my sister (who had finished a few minutes before me), and we headed back to the buses. (We neglected to take a shot of ourselves post-race, with medals- #RaceFail.) I would have liked to hang around the post-race area for a while, but my mom had already been on her own waiting for us for several hours, and we really wanted to get our park touring started for the day. Next time- I'll spend more time post-race! The 2014 Expedition Everest Challenge was just officially announced... a timed 5K race, with obstacle course features, a scavenger hunt, and an in-park post-race party. This has my name written ALL OVER it. 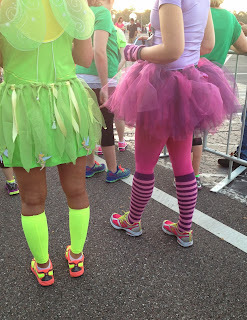 Plus, I want to do another 5K before I tackle my next big goal: a runDisney 10K. Wow, I LOVED this recap. Great detail! The selfies were hysterical! Congrats on a great finish for a super-fun event! Great post KJ!!! Keep on running!